Hokusai’s Waterfall Prints - Hokusai's waterfall series was a set of eight oban prints published by the same publisher of his "Thirty-six views of Fuji" series, Eijudo. The human figures are always dwarfed by the fantastic scale of the waterfalls. Hokusai expanded on one of his favorite themes with the waterfall series - a contrasting of the mass and majesty of nature with the small, fragile human form. This theme was often a theme for the "Thirty-six views of Fuji" series. 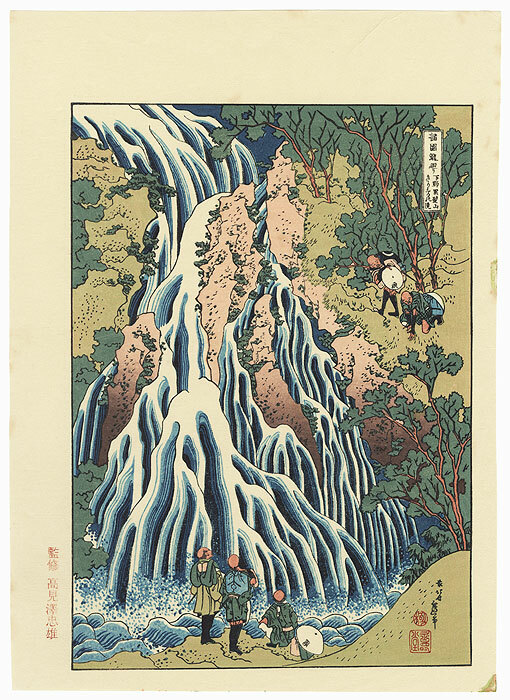 However, in the waterfall series, as opposed to the still and immobile Fuji, the waterfalls crash and roar, crawling over rocks and falling through the air, Hokusai perfectly captures the experience of a large waterfall for the viewer. 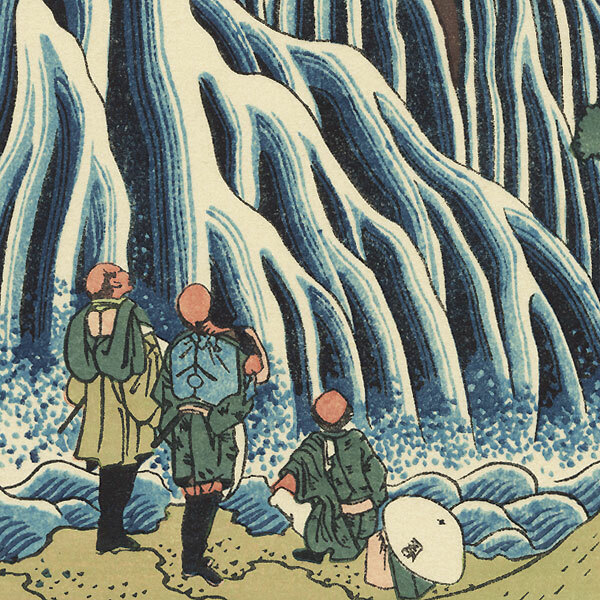 The designs for the waterfall series are, without question, Hokusai masterworks. Reprints of this incredible series are quite rare, so don't miss this opportunity to bid now! Kirifuri Waterfall on Mt. Kurokami in Shimotsuke Province - Fantastic depiction of the Kirifuri Waterfall on Mount Kurokami in Shimotsuke Province. The famous falls descend about a hundred feet and are located in the mountainous Nikko area. Rivulets of water crash over the rugged cliffside, splashing into the turbulent pool below and creating a striking graphic pattern. The small figures stopping to enjoy the view are dwarfed by the majestic site. A masterwork Hokusai design from his famous waterfalls series. Condition - This print with excellent color and detail as shown. A few spots, a couple creases at edges. Please see photos for details. Good overall.